Commissioned by the Amsterdam Surgeons’ Guild, The Anatomy Lesson of Dr. Nicolaes Tulp was the first major Rembrandt work to catapult the young painter to international fame. 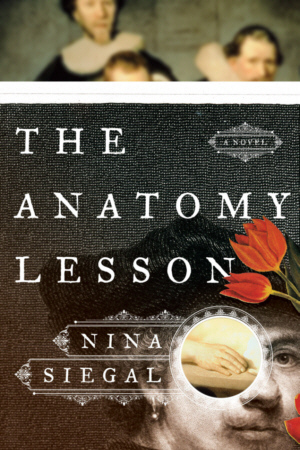 Taking this painting as its inspiration, Nina Siegal’s novel The Anatomy Lesson opens on the morning of the medical dissection and follows several characters as they prepare for the evening’s big event: we meet Aris the Kid, a one-handed coat thief who is awaiting his turn at the gallows; Flora, the woman who is pregnant with his child and who hopes to save him from the executioner; Jan Fetchet, a curio collector who also moonlights as an acquirer of medical cadavers; René Descartes, who will attend the dissection in the course of his quest to understand where the human soul resides; and the twenty-six-year-old Dutch master himself, who feels a shade uneasy about this assignment. And in the twenty-first century, there is Pia, a contemporary art historian who is examining the painting. As the story builds to its dramatic and inevitable conclusion, the events that transpire throughout the day sway Rembrandt to make fundamental changes to his initial composition. Bringing to life the vivid world of Amsterdam in 1632, The Anatomy Lesson offers a rich slice of history and a textured story by a young master.